The purpose of all of the various forms of navigation on this site is to help you, the user, locate the individual species pages. 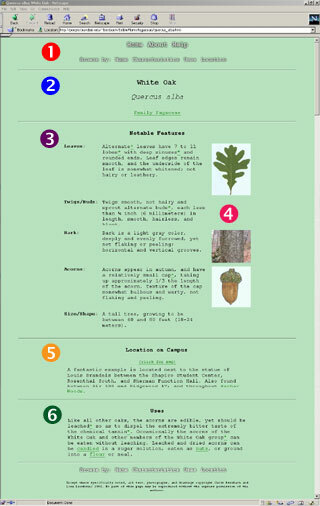 These pages contain the bulk of the information that you will need to identify and prepare edible plants on campus. An example of one of these pages is displayed below on the right, with numbered labels referring to explanations on the left. Throughout this site, there are terms that may not be clear at first to many users. We have attempted to catalogue as many of these terms as possible in the glossary, which is linked to asterisks following the terms. The definition of any term with a linked asterisk (*) after it can be viewed by clicking on the asterisk. If you have questions regarding the funtioning of the navigation systems (browse by names, characteristics, uses, or location), either have a look at the central browsing help page, or just refer to the main page of that navigation system by clicking on it on the toolbar at the top of the page. This is the navigation bar. It allows you to choose to what area of the site you want to go. These bars are at the top and bottom of almost every page on this site. Clicking on "help" anywhere on the site will bring you back here. This is the common name, scientific name, and taxonomic* family* of the plant on the page. The notable features section provides you with descriptions and small pictures of the key features of the plant. The small pictures in the notable features section are thumbnails that will bring you to larger, more detailed images if you click on them. This section tells you where on the Brandeis campus you can locate the plant. The "Click for map" link will open a window displaying a section of the campus map with a small green arrow denoting the location of a good specimen. The uses section describes the ways that the plant can be consumed, and if there are any precautions you should take regarding the plant. Click on the green links here to go to the "uses" section of the site, where you can learn more about how to actually prepare wild plants for consumption.